Today’s users are spending more time on apps than ever before. What’s not increasing is the number of apps users regularly engage with, which has remained stagnant at 27 per month. For app owners, this means more competition vying for the coveted title of “go-to” app. So, how do you make your app stand out from the rest? According to users, one key way is to focus on performance – 96% see app performance as important. However, delivering high performing mobile app experiences isn’t easy. 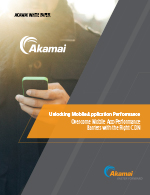 Read our new white paper, Unlocking Mobile Application Performance, and learn about the five key barriers to mobile app performance and the essential capabilities for improving app performance that only the right CDN can deliver.